If you are taking your car abroad you should check your motor insurance to make sure you are covered, that’s according to this article. Most drivers do not realise that their comprehensive policy does not apply when driving outside the UK. Apparently only one in ten policies include European breakdown cover and policies that do include it will often only give third party cover when driving outside the UK. So if you are planning on taking your car abroad it’s sensible to call your insurer to make sure you are covered before you go. Mail to parts of Derbyshire will be delayed following a localised postal strike. The strike will last for four days from Wednesday 30th of May to Saturday 2nd June when normal service will be resumed. The strike is as part of a protest at the closure of Heanor sorting office. Fees can really mount up when using your debit card abroad. It doesn't help when you think your card is free to use and then find out that you have been charged a fee after all. HSBC advertise the fact that their debit cards are free from transaction fees when used abroad. They do however, charge 2.75% on top of the exchange rate for overseas withdrawals which they say is not a fee, its simply how they calculate their exchange rate. It sounds like a fee to me. If you've traveled a lot and have spent time in extortionately charged Internet cafe's trying to read your email and sending letters from the Internet you've probably decided to start taking your laptop with you and making use of WiFi hotspots instead. WiFi hotspots enable you to connect to the Internet from your own laptop or WiFi enabled device usually for a small fee and in some cases for free. I signed up with BT OpenZone which enables me to access the Internet from various WiFi hotspots world wide for a monthly fee which works out considerably cheaper than using an Internet cafe. Accessing a WiFi hotspot is usually a simple affair and involves you turning on your computer and accessing any web page which will redirect you to the WiFi providers website. If they are one of the larger providers such as T-Mobile or BT OpenZone they'll provide you with a login screen to login to their service, or if you are from another service provider you are sometimes given the option to log into that service via them. If you don't have an account you can usually sign up for an account online or just buy time online, usually in 1 hour increments. After you are logged in, most WiFi providers will display a status page showing you how much time you have left online. If you would like to find WiFi hot spots in the location you will be traveling, sites such as WiFinder and BT OpenZone are a valuable resource. As usual when we have a Bank Holiday in the UK, the volume of traffic increases on the roads, often meaning total gridlock. You can try to avoid this by planning your journey in advance to avoide traffic blackspots. The Guardian has a useful guide to areas that are expected to have large volumes of traffic. You can also plan your route using the RAC's journey planner, which helps you to avoid traffic blackspots. For those people planning to travel by train this weekend, you might want to refer to this list of planned engineering works from National Rail as many works are carried out over the weekend leading to further disruption. Monday 28th of May is a bank holiday in the UK. This means that there is no postal collections. Any mail sent after 11am on Saturday 26th of May will be processed and posted on Tuesday 29th of May. The City of Derry Airport has been closed because of safety concerns after problems were found with runway drainage and bird conrtrol in the area. Ryanair have now cancelled all flights to and from the airport as of Midnight on Friday 25th May. Any passengers booked on flights are advised to contact their airline for a refund. Ryanair announced today that it will fly to 13 more destinations from Bristol International Airport. The extra flights will start in November and are expected to produce a fivefold increase in passenger numbers at Bristol. The new destinations are Bratislava, Budapest, Derry, Dinard, Katowice, Knock, Milan, Porto, Poznan, Riga, Rzeszow, Salzburg and Wroclaw. With these new budget flights it seems like the ideal time to book a long weekend away. Still on a holiday theme I came across this article on thisismoney about the cheapest destinations for UK travellers taking into account the current exchange rates. Apparently you can currently get the most for your pounds by heading to countries such as South Africa, Namibia and Botswana. This is because the pound has strengthened greatly against those local currencies within the past year. For example a pound will now get you 12.8 rand, 10% more than this time last year. It’s a different story though if you are thinking of heading off to Eastern Europe you are 13.6% worse off than last year. The same article has an interesting section about using credit and debit cards abroad. Last time I went abroad I was aware that there would be a charge for overseas transactions but didn’t really pay much attention to what the charges were. It was a bit a surprise to see how the charges had mounted up just in one week. The article contains a handy table comparing what providers charge for overseas transactions. Interestingly enough if you have a credit card from the Nationwide or the Post Office they do not charge you at all. Most other credit card providers have a 2.75% charge when used overseas. Likewise with debit cards most companies charge not only for making card purchases but also to withdraw cash. This is where I got out with my Bank who charges 1.5% on every foreign withdrawal. Once again Nationwide does not charge its customers for overseas transactions. It might be time to open another account to use when going on vacation. I’m sure in the long run it will help save a lot in unnecessary fees. This was my first trip to Ireland and although most of our time was spent at a friends wedding, I left with the intention of going back again for a longer stay. It definitely wasn’t the weather that made my stay enjoyable, it basically rained on and off all weekend. I did however find it refreshing to be surrounded by beautiful countryside instead of feeling rather crammed in as we tend to be back in London. One thing that immediately struck me was that every person we came across whilst in Ireland greeted you with a cheery good morning or a friendly wave. Back in London, things are slightly different, if you even so much as glance at another person on the bus or train, you are met with a blank, unfriendly look. During this visit we hired a self catering cottage from Dream Ireland. The cottage is located in the grounds of the Mount Wolseley Hilton Hotel. It included a double room with en-suite bathroom, two rooms with twin beds and a third room with a single bed. It also had another bathroom and toilet as well as kitchen and large living/dining area. In fact it was much bigger than our house and cost 420 Euros, that’s about £287. I was very impressed with the accommodation offered for the price and you also had the option to use the hotels pool, spa and gym. The cottage also had the advantage of being located within an easy five minutes from the main hotel which has several restaurants serving food for most of the day and several bars which were open until very late. The atmosphere in the hotels bar was a welcome change from a smoky pub; smoking having already been banned in public places in Ireland. On the night we arrived, at nearly midnight, we were surprised to find the hotel’s main bar still open and the locals enjoying a good singsong well into the early hours of the morning. In fact they were still singing when we left at three in the morning. In all it was an enjoyable few days and I will definitely be going back. I and my husband are heading off to Ireland this weekend for a friends wedding. It always occurs to me when going away how much easier it is for men to pack. They simply pack a pair of jeans and a pair of trousers and a couple of tops. My packing dilemma goes something like this. We are going away for 4 days. The first day we are at the wedding, so I have my dress and shoes, but what if it is cold, I might need a jacket. The next day I will need something casual to wear during the day, so I pack jeans and trainers, but wait I am going out in the evening, will I need something smart? So I pack a skirt and top, but what if it’s too cold for a skirt… I pack trousers. The thing is trousers require different shoes to a skirt so I pack my smart boots as well as my strappy shoes. Ok, the bag is starting to get heavier at this point and thats before I think about day three. Men have it easy. Apologies for the PC2Paper website being down yesterday. This was caused by road works cutting the power cables that ran into the building our server is hosted in. This will cause a short delay in mail delivery. We are now trying to put measures in place to prevent this happening again. The Greek island of Zante or better known by the locals as Zakynthos has long been a favourite of mine. Depending on the time of year you go Zante is either a furnace or incredibly hot, I have never encountered a single cold day when visiting Zante. And you soon understand why the locals do most of their socialising in the evening and leave the hot day for sleeping. When visiting Zante I would suggest wearing shorts and getting yourself a pair of sandals, your feet will only roast in trainers and socks. 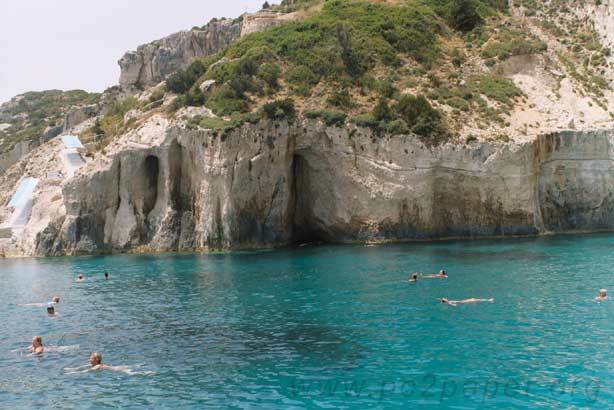 Zante is full of nice beaches and its very easy to get badly sunburned, another word of warning is when you go down to the beaches take a large bottle of tap water with you to rinse off the sea water before you tan yourself. The sea water is so full of salt that mixed with the strong sun can easily chap your skin and lead to painful sunburn. Talking about the water its important to only drink bottled water and not tap water, while the locals will drink the tap water its far to high in minerals for people who have not been put onto it gradually and could make you sick. The local "towns" or "resorts" are geared towards tourists you will find many of the local restaurants on the so called high streets will have Australian, English, Chinese themes in addition to Greek restaurants. I often found the best place to eat good Greek food Zante style, is in the little unkown taverners you will sometimes find on the outskirts or down little country lanes. You know they serve good Greek food when even the locals eat there and keep coming back. When staying at a hotel ask the guy behind the bar what he suggests. I always find the locals welcoming and friendly and when I am there I always stock up on the locally produced olive oil which the super markets here in the UK can't even begin to compete with on taste. The localy produced honey is also out of this world and is essentially honey made from Thyme pollen. Another thing I became hooked on was 5 star Metaxa a drink not unlike brandy but much better. Three star Metaxa rivals brandy and can be drunk with coke hover 5 star should always be drunk by its self. The Communications Workers Union is to ballot its 13,000 members in Royal Mail on possible strike action, the results are to be announced on 7 June 2007. The strike is over a 2.5% pay rise linked to efficiency gains the union fears may lead to jobs cuts. Strike action could lead to a delay in all UK mail over this period including mail PC2Paper sends via Royal Mail. We will keep you updated on any changes in this situation. Don't forget fathers day on Sunday 17 June 2007. Why not send a Fathers day card? I had a chat with one of our technical guys Rob Forber yesterday about PC2Papers API interfaces and how he had just finished helping one our customers with a Delphi interface into PC2Paper. Now I'm not a technical person and all I know is that Delphi is another programming language and that he was excited by the accomplishment. My interest is that we have helped another of our customers to interface their back office systems with our service. For those who don't know PC2Paper API or Application Interface enables our customers to integrate their own back office systems (systems they use to run their businesses) and websites so that they can automatically send letters via our service. Over the coming months I will be getting Rob to write a few articles about how you can write your own interfaces into PC2Paper. It always amazes me how so many people still fall for online scams. I suppose the Internet being so vast and with thousands of new users everyday there is bound to be fresh meat for the scammers. Sometimes I wish when people are first introduced to the Internet that they are made aware of scams. One of the most popular of these scams is the Nigerian 419 Pen Scams or better known as an Advanced fee fraud scam . These scams have been going on for a long time and basically work on the basis of getting you to pay some money up front to help them get some money stuck in a back account in some third world country to be released and you guessed it there is always a corrupt official that needs to be bribed with your money. Now there is a group of people who bait these type of scammers and they have one of the most hilarious web sites I have ever seen 419 Eater. If you have been offered a work from home opportunity be wary of web sites that ask for money up front. If you are on a web site that claims not to be like any of the other get rich quick scheme web sites they probably are. If you are on a web site that claims to have the secret to getting rich quickly with hardly doing anything in most cases they will have a very long what I call "Sales Piece" about how this secret changed their life until they eventually ask for money or ask for your contact details. In most cases their secret to getting rich which they will divulge to you is actually a web site just like theirs, you pay them $50 (or what ever the amount is) and you get a site just like them to lure in someone else and it starts all over again. This is in fact a pyramid scheme which effectively is a non sustainable business model and in most countries this is illegal . It relies on people bringing more and more people into the scam to keep it going. These kind of schemes have been responsible in the past for destroying small economies. How long has the site been around? You can often check this by looking at the WayBackMachine, who else has talked about this site? Google the site and see what others have said about it. If the scheme is genuine the person running it won't mind you asking them many questions. After all you are the investor you have something they want - your money. "WAIT! Is this an Internet SCAM?"